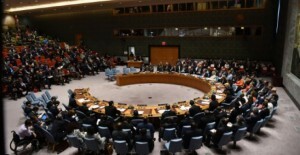 The UN Security Council is expected to meet behind closed doors at Russia’s request on Thursday to discuss sanctions imposed on North Korea, diplomats said. The request for consultations came just hours after President Donald Trump said he was in “no rush” to solve the crisis over North Korea’s nuclear programme. The United States has insisted that the raft of measures including a cap on oil and fuel deliveries and a ban on exports of North Korea’s raw commodities must be fully enforced until Pyongyang has scrapped its nuclear and ballistic missiles programmes. Russia and China have argued that North Korea should be rewarded with an easing of sanctions for halting missile tests and opening up a dialogue with the United States on denuclearisation of the Korean peninsula. Trump said he hoped to meet with North Korean leader Kim Jong Un early next year but that he was “in no rush”. “I would love to take the sanctions off, but they have to be responsive, too,” Trump said.